Do you need another charm for your charm necklace or bracelet? Our Silver Hug & Kiss Heart Charm is a great addition. 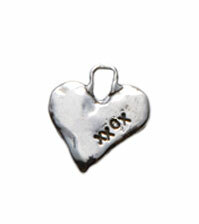 The Hug & Kiss Heart Charm is stamped with xxox to carry hugs and kisses with you where ever you go. This sterling silver charm will make a great addition to any charm bracelet or necklace.